10-Jan-2004 -- After the successful visits to 32S 28E and 32S 29E the plan was to attempt 30S 28E in Lesotho, a Confluence we had been eyeing for more than a year as it lies in the so-called "four waterfalls area" between Semonkong and Ketane. The Maletsunyane waterfall drops 200 m into a deep gorge and is the highest free-falling waterfall in Southern Africa. The Confluence itself lies more than 20 km from the nearest civilisation roughly halfway between Semonkong and Ketane, but we decided to attempt the approach from Semonkong where there is a lodge close to the Maletsunyane waterfall. We expected a long hike over very mountainous terrain. Luckily Ferdi's recently sponsored Garmap software indicated a track that could possibly get us within 10 km of the Confluence. Ferdi in the meantime had some bad luck with his vehicle. What seemed at first to be a blown gasket or possibly a loose bolt, turned out to be a cracked top. After several days at a garage in East London and various attempts to find another engine and installing it, while we spent a few days in the Hogsback area, Ferdi gave up and decided to put the old engine together again and to take his chances with the mountains of Lesotho. We left Hogsback on Friday 9 January and entered Lesotho at Van Rooyens Gate near Wepener, in order to bypass the capital city of Maseru. From there we travelled along the A20, A2 and A5 through Mafeteng to the university town of Roma, where we hit the first major uphill onto the Golden Gate sandstone formations. We had been travelling very slowly all day to allow Ferdi to keep up. The uphill was the end of Ferdi's attempt though. The car overheated, the turbo starting leaking oil onto the manifold and the brake booster also overheated, leaving him with a smoking and steaming vehicle with no brakes. Sadly we realised that they were not going to make it to Semonkong, as the really big mountains still lay ahead and we were running out of time. Luckily they managed to get back home safely after overnighting in Ladybrand. In the meantime Dirk and I and our families proceeded over really magnificent mountain passes to Semonkong and a very nice lodge where we had booked accommodation in the backpacker's dormitory. A 1:50,000 map at the lodge showed that there was a small track to a shop about 10 km directly north of the Confluence. From the shop there were two possible approaches to the Confluence. The first seemed to be a donkey track traversing along the top of the ridges to the west of the Confluence, while the second was a similar track that descended down into the Maletsunyane river valley to the east and then followed the valley south towards the Confluence. Both approaches would be longer than a straight one, but the straight line climbed over a high ridge and then crossed two more ridges before descending very sharply down to the Confluence. The morning of the 10th dawned wet and misty and the track to the shop was muddy and slippery. We stopped along the way for a quick look at the waterfall. At the shop we tried to go further, but here the track got too slippery and the bakkie (4x4 pickup truck) came to a wheel spinning stop. A very careful reverse and turn around almost ended in the gully below when the track edge threatened to give way below us. Back at the shop, the shop owner gave us permission to park and promised to look after the vehicle while we were gone. We immediately started climbing up the ridge behind the shop in order to get a view of the terrain and discovered a foot path / donkey track not shown on any of the maps we had looked at. The track seemed to be a kind of trade route linking villages high up the mountain slopes above the Maletsunyane valley to the shop. The track seemed to be going in the right direction so we decided to follow it for the time being. In the meantime the sun had come out and we starting getting thirsty. We ran out of water within 3 km. Dirk's wife, Amanda, had hiked in the area more than 20 years ago. They had drunk the water from the streams, but were warned by a local chief not to and eventually their whole group had become ill for a week. We had nevertheless planned on getting water from small streams, but we now discovered that the mountain slopes were quite heavily populated and intensively farmed, and the water in the streams did not seem fit for human consumption. After passing through the first small villages, small children started following us, eventually taking turns to hold my daughter's hands. Eventually we were quite a large and rowdy group wandering along the track, except that we were getting thirstier by the minute. Then the children stopped at what at first sight appeared to be a mud puddle, but at closer inspection turned out to be a carefully managed little spring. The children indicated that we could drink the water and produced a small plastic container, which they seem to have been carrying for this express purpose. They first carefully cleaned the container, filled it with water from the puddle and offered it to us. After we had drunk, they all drank as well. We filled our water bottles and continued the hike refreshed. At the next little village a chief and two elders called us closer and wanted to know where we were going, where we had come from, where our vehicle was parked, etc. 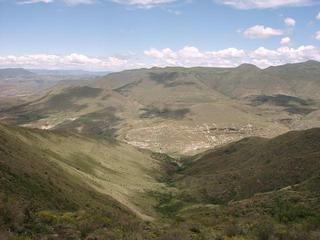 We did not know how to explain the Confluence Project and merely indicated that we were hiking south towards the Maletsunyane valley. We also explained that we had far to go and that the little children should rather not follow us. He spoke to the children, with them answering in a choir, and then told us that the children were very happy and that they would accompany us wherever we were going and back. Eventually we were on our way again. As far as we went people would ask us where we were going, then they would shout this information to their neighbours, who would pass the information on to their neighbours, so that the whole mountain side erupted in shouts and laughter. Just after midday we reached the sharp 600 m descend into the Maletsunyane valley, with the Confluence now less than 2 km away. Here the children all suddenly disappeared, possibly because we had crossed into another chief's area, or possibly just because they did not feel like climbing down and then back up. We descended alone and after stumbling in and out of the small gorges down in the valley, we reached the Confluence just after one o'clock. What a disappointment. After hiking through these magnificent mountains with views all around, the Confluence was hidden in a small little river bed. By now our water was finished again and we decided to go as far upstream as possible and to risk drinking the stream water. A new crowd of children had started to gather on the ridge above us. They seemed to sense what we were looking for and pointed to a small poplar bush. Here we found another small spring brought to the surface with a PVC pipe. We could fill our water bottles and drink until we had stomach cramps. Now our problem was that we had brought very little food with us, certainly not enough to share with the twenty or so children that had gathered around us. We could also not sit down and eat with them watching us. We handed out some sweets and then immediately started back. When we left the crowd behind, we stopped in a little gorge and had our sandwiches. It was now past half past two already, and a thunderstorm was building up in the south. We had to start hurrying back to our vehicle. The climb out of the valley proved to be extremely tough and hot, but soon afterwards the clouds started overtaking us and the lightning started to play around us. One old man wanted to talk to me, but I indicated that the rain was coming and that we had to hurry. His reply was: "But are you fast enough?" We stopped at the first little spring to refill our water bottles and raced on, feeling very exposed on the mountain side with the lightning all around us. About 1 km from the shop the storm caught us and we had to put on waterproofs, but we managed to get to the bakkie at six o'clock before it starting raining really hard. We had covered nearly 30 km in 8.5 hours and were all quite exhausted. A slow drive on the muddy and slippery track got us back to the Lodge by seven o'clock, where Amanda had a lovely "potjie" (type of stew) waiting for us.